Just spent an enjoyable and illuminating two days in at the Australian Society of Authors in Sydney learning all there is to know about self-publishing. It’s a daunting proposition, but thanks to the many experts in the field who came to speak to us, the process became far more doable while providing contacts with experts in the different fields able to provide professional advice should it be needed. And we were given a terrific follow-up kit to take home as a memory-refresher. It’s given me a lot to think about – but also the confidence to go ahead as I now have the contacts I’ll need to seek the help along the way. Congratulations to the ASA for a very informative workshop! 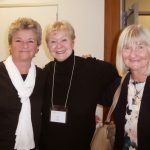 Pictured with me are ASA organiser Laurine Croasdale and self-published author of the wonderful True to Life books on endangered animals, Jan Latta. 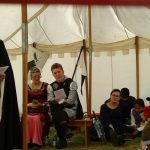 Following the 2-day intensive workshop I then spent a most enjoyable day at the Medieval Fayre at St Ives, watching the Grand Parade and jousting, plus having a look around at all the wonderful craft and side stalls that were celebrating all things medieval. Learning to sing Gregorian plain chant was a particular challenge, and joy (pictured – except I think the ‘leader’ of our group may have been cut out in this pic? I hope not!) 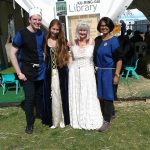 A lot of time was spent in the Kuringai Library Tent where all sorts of fabulous craft activities were available for children, from making jewelled crowns to blowing dragon soap bubbles, and playing medieval checkers and chess to creating fairy wands and play doh fantasy shapes – or listening to me reading an assortment of stories about dragons, knights and medieval time (a subject close to my heart!) Pictured outside the tent with me are the tireless and hugely creative library team who entertained so many children while giving their parents a much-needed break!